The standard model of the NEXIV series. It handles a variety of measurement tasks including those for mechanical parts, molded parts, stamped parts and various other workpieces. Its maximum magnification module achieves measurements of fine workpieces. 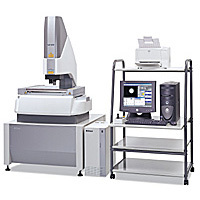 Perfect for measurements of typical MEMS parts, high-density PCBs and semiconductor packages. With ultrahigh precision and versatility, this model can serve as the master instrument in your laboratory. Ideal for high-precision dies and molds. With an ultrahigh-precision stage and maximum magnification module, it measures fine workpieces with ultrahigh accuracy (e.g., critical dimensions on patterned masks and bump heights). 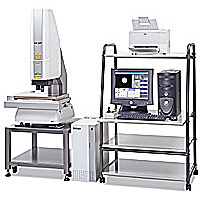 High-speed measurements with a large stroke stage. 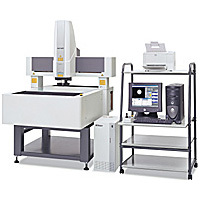 Optimal for measurements of PCB patterns and external dimensions of a display panel. You can save inspection costs by measuring a number of small parts at one time after placing them together on the stage. Amazing 120X zoom combined with a big stage enables ultrahigh magnification measurements on big workpieces. Ideal for measuring high-density PCBs and their masks. ALong 1000 x 800 mm stage stroke provides maximum performance in the measurement of large-size workpieces such as FPD devices. The model achieves ultrahigh magnification measurements with a long 1000 x 800 mm stage stroke. Ideal for measuring minute linewidths of large-size display panels.